From an award-winning author comes a wise and tender coming-of-age story about a nine-year-old girl who runs away from her Mississippi home in 1963, befriends a lonely woman suffering loss and abuse, and embarks on a life-changing roadtrip. Whistling past the graveyard. That’s what Daddy called it when you did something to keep your mind off your most worstest fear. . . . In the summer of 1963, nine-year-old Starla Claudelle runs away from her strict grandmother’s Mississippi home. Starla’s destination is Nashville, where her mother went to become a famous singer, abandoning Starla when she was three. Walking a lonely country road, Starla accepts a ride from Eula, a black woman traveling alone with a white baby. Now, on the road trip that will change her life forever, Starla sees for the first time life as it really is—as she reaches for a dream of how it could one day be. 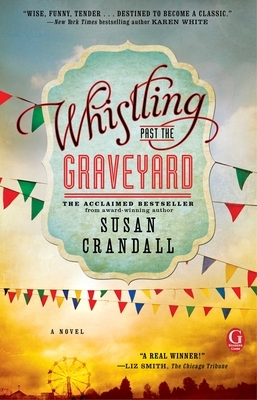 Susan Crandall is a critically acclaimed author of women’s fiction, romance, and suspense. She has written several award-winning novels including her first book, Back Roads, which won the RITA award for best first book, as well as Whistling Past the Graveyard, which won the SIBA 2014 Book Award for Fiction. Susan lives in Noblesville, Indiana, with her family. It’s not easy to keep such a young narrator convincing for more than 300 pages... Readers will take to Starla and be caught up in her story.